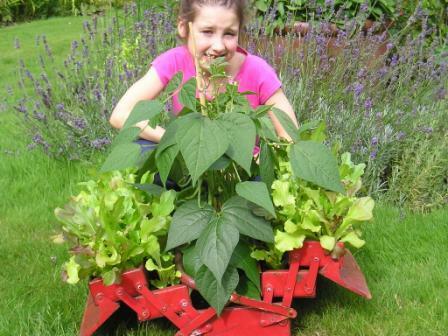 Thank you to every one of our entrants in the Kids under 15 Growing Veggies in an Unusual Container Competition.Debbie was asked to decide the winner and she had a great time looking at all your original ideas. We feature the winning entry here, which ingenuously uses an old tool box! A red one to boot! It all made a very colourful display & we congratulate Karen on growing some really healthy plants in such a small space. Well done! You have the makings of a great allotment gardener! Eat your heart out Joe Swift! We hope you love your prize and grow lots of fabulous things with it! On our very early walk on Sunday morning we were enjoying watching some young deer, watching us, everyone keeping very still, when I noticed some plastic in the hedge. Thinking it was a grain bag that got away from the farmer I went to rescue it to find that it was a spent helium balloon wishing me a Happy 21st Birthday! Thankfully it was wrong. I really don’t want to be 21 again! Do you know that it is ‘Older Peoples’ Day’ on 1st October? I bet you didn’t!! Well I didn’t either until I received a special invitation for the 1st October to a gathering in the name of Older People. I will tell you all about it next week, but it has got me thinking. When is old? It’s easy to grasp a number and say an age ‘and over’, but that must be the worst way to define ‘old’. For me old people are those who drive at 15 miles an hour on winding roads where you cannot overtake, then speed up when the road goes straight again! They are the people who, when they have picked up their pension on pension day go into the supermarket and aggressively push their baskets round so that they conveniently crash everyone else out of the way!! Childish or what? I would love to hear your definition of old, and why you are NOT old so please drop me a line. I will drop you a line next week and tell you what my gathering of old people was like. I like a challenge to my age, so please offer them but please do not challenge me to a game of Rugby! I may not last after half time. •Cool the jam a little before putting into jars. •Ideally the jars should be warm when the jam is added. • Seal tightly and look forward to enjoying through the winter months or of course give to friends as presents! We really do now have our very own ‘Delia’ at The Recycle Works as Charlotte is our cookery queen! We’ll have to keep coaxing her to give us more as it seems as though you love them! 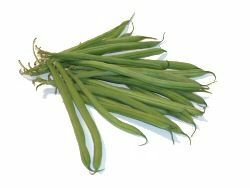 If you find yourself with some rather large runner beans, that are past their best for eating, this is a great recipe! You don’t need to use old beans – younger ones will do better, but it means you can make the most of your crop. This is an excellent recipe that keeps really well and children will love it, I know as I grew up eating it! It goes well with both hot and cold foods – and curries too! Chop the onions and cut the beans into smallish pieces. Cook chopped onions in a pint of the vinegar until tender. Meanwhile, cook sliced beans in well-salted water until tender. Meanwhile, mix all the dry ingredients to smooth paste with the remaining vinegar. Strain cooked beans, then add to vinegar & onions and cook for ten minutes. Add sugar and rest of ingredients and simmer for a further fifteen minutes, so that the mixture thickens. Well Charlotte’s been busy putting together her recipes again so if you have a glut of green tomatoes this year, which is highly likely, why not try this recipe? Cut unpeeled tomatoes into 1/2 inch slices. Sprinkle slices with salt and pepper. Let tomato slices stand for 15 minutes. Meanwhile, place flour, milk, eggs, and bread crumbs in separate shallow dishes. Heat 2 Tbsp of olive oil in a frying pan on medium heat. Dip tomato slices in milk, then flour, then eggs, then bread crumbs. Fry half of the coated tomato slices at a time, for 4-6 minutes on each side or until brown. As you cook the rest of the tomatoes, add olive oil as needed. Season to taste with salt and pepper.